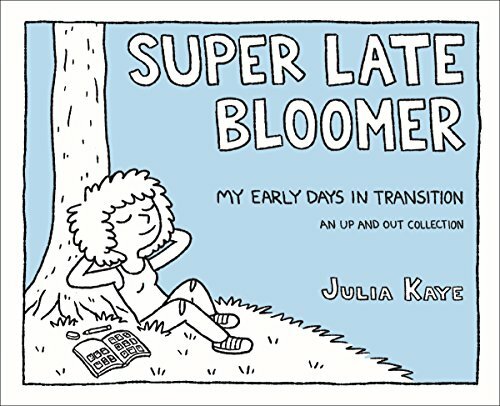 Super Late Bloomer by Julia Kaye (#comic #transgender #biography) - ふたなりっ娘! This entry was posted on May 6, 2018, in コミック, Feeds and tagged biography, comics, Julia Kaye, Review-Sally, transgender. Bookmark the permalink. As Julia Kaye explains in her preface to Super Late Bloomer: My Early Days in Transition, the comics here were drawn daily, one per day, during the early days of her transition. They were both a coming out and a form of therapy, a creative outlet for a transgender soul without a supportive community on which to rely. The first few comics are both sad and sweet, a portrait of a woman happy with herself, even if society struggles to accept her. There is a conflict here in Kaye’s sense of self, a battle between who she was, who she is, and who she wants to be. Some days are better than others, with small victories celebrated, but others are sad and lonely, with impatience over the process and a need for external validation a common theme to them all. Those little moments are my favorite, capturing things that most people take for granted, but which are pivotal for someone in transition. It is interesting to see some comics censored, with names and faces disguised, presumably to protect friends and family. It reinforces the fact that these were cartoons drawn for Kaye, with the decision to publish coming later. Her coming out – to friends and coworkers – is a powerful moment. I loved the panels where she sings along with Against Me in the car, because I can so relate (True Trans Soul Rebel is actually my ringtone! ), and her inability to accept compliments, reading veiled insults into them, is so familiar. The comic about seeing her life in black and white was particularly interesting, since I struggle to find those shades of grey as well. There are so many comics here that speak to me, moments with which I can relate, but it is the progression of her transition – physically, emotionally, and mentally – that draws them all together into a coherent narrative. It is not a perfect story, no fairy tale with a happy ending. Kaye is honest with herself, and that means she is honest with us, sharing her fears and doubts, even late in transition. The comics are simple, line drawings like you would see in the newspaper, but they have style and energy to them that allows her talent to shine as bright as her identity. A delightful read. Julia Kaye is an artist and illustrator whose Up and Out webcomic has garnered hundreds of thousands of readers and wide critical praise. Her work has appeared on the upcoming Disney show Big City Greens, in Maxim and Cosmopolitan, and on BuzzFeed and GoComics. Julia lives in Los Angeles.